It sounds rather interesting given the recent comments and references to Cajaya. I think that thread had a lot to do with whether generators run on batteries or not. CTony, thanks for the link. I just finished reading the whole thread. Wow…entertaining to say the least. Oh, I can only take some credit. A few others weilded their pointy sticks nicely. I try to keep my input confined to licensing and career advancement usually. C captain aint getting soft. Beware you may awake a sleeping giant. 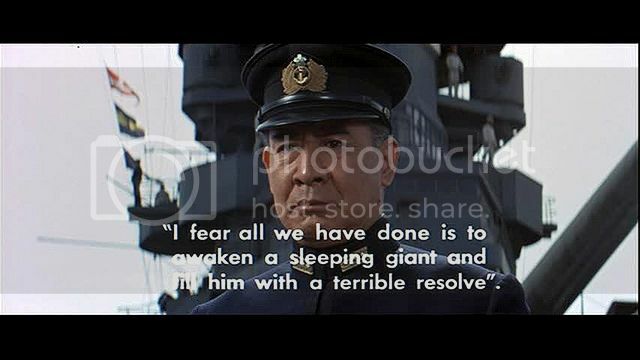 although it is quite possible that Yamamoto never did say this as in that great movie however many believe that he did indeed feel that way in his mind. He knew completely that the US could outproduce Japan many, many times over and in a protracted war it could never prevail. Pearl Harbor was tactically brilliant (although terribly executed) it was a huge strategic blunder in that it silenced all the isolationists in the US overnight and gave the Nation a cause to seek the utter destruction of Japan that a less overt act of war would not have provoked. If you haven’t noticed, I’m trying to!! I like to push buttons and see juuuuuuuust how far I can go with it! sorry to disappoint you son, but the tremendous might of the “pointy stick” is far too powerful and awesome to waste on a little fry such as yourself. Maybe after you grow up? There you go josh, he let you prick your fingertip. maybe the hull is older than half a century but don’t test me son…I am fresh from an extended yard refit, my barrels are all relined, the magazines are filled with power and shell, boilers retubed and in all other respects ready for action. You people need to start playing world of warships and lett all this accumulated rage be used to something good. Thought that was this forum’s main purpose.